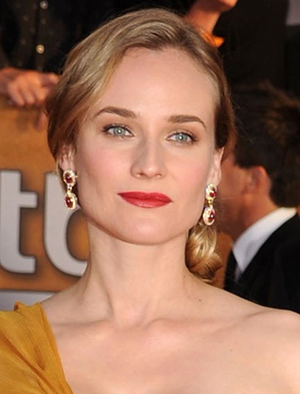 All Posts Tagged With: "2010 SAG Awards"
GET THE LOOK: Nominee Diane Kruger’s glamorous asymmetrical Jason Wu gown (which BTW Marta loves Diane’s dress! Best Dressed for sure!) was the inspiration for the soft, romantic side-chignon that celebrity stylist Mark Townsend created for the 2010 SAG awards. “I started by taking a small amount of Moroccanoil Treatment and finger combed it through Diane’s dry hair” explained Townsend. “The original Moroccanoil is super light-weight and absorbs right in, to give the hair amazing shine without weighing it down. GET THE LOOK: Looking camera ready, Giuliana Rancic and Toni Collette were glowing as they stepped on the red carpet with HDTV perfect skin for the 16th Annual Screen Actors Guild Awards. Once again, Hollywood’s leading celebrities turned to the ultimate skin-finishing brand, St. Tropez, for an award winning look. Frederic Fekkai Celebrity Stylist Adir Abergel created Sandra Bullock’s hairstyle for the 16th Annual Screen Actors Guild Awards. The Look: modern, carefree twist. First, Abergel applied FEKKAI COIFF CONTRÔLE IRONLESS STRAIGHTENING BALM to keep the hair frizz-free. Then, he dried the hair with a FEKKAI LARGE ROUND BRUSH to create a smooth foundation. Sandra Bullock at the 2010 SAG Awards: Do you love? BEST DRESSED: I adored Anna Paquin’s dress at the 2010 SAG Awards. The colors looked amazing on Anna. Loved the matching gold infused shoes, hair and makeup. Also, cute to see how Anna Paquin and her partner Stephen Moyer are inseparable on the red carpet. Must be love! BTW Anna Paquin is a New Zealand actress. Anna Paquin at the 2010 SAG Awards: Do you love? BEST DRESSED: Kate Hudson brought pure elegance to the red carpet last night for the 2010 SAG Awards. You had to see the back of the dress to really appreciate the whole look. I hear from Celebrity Stylist Rachel Zoe’s Twitter that she was the style genius who picked Kate’s white PUCCI gown. Marta LOVE:) “White is the new black :)” according to Rachel Zoe. Kate Hudson at the 2010 SAG Awards: Do you love?